We have the opportunity to make a unique group purchase of a large number of 220 MHz crystal controlled FM transceivers. Ed Clegg, W3LOY, has been informed of the need for some inexpensive gear for use in packet radio. 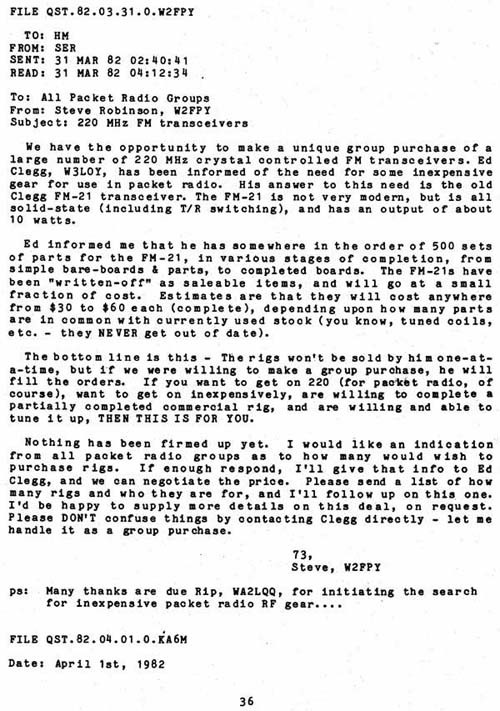 His answer to this need is the old Clegg FM-21 transceiver. The FM-21 is not very modern, but is all solid-state (including T/R switching), and has an output of about 10 watts. Ed informed me that he has somewhere in the order of 500 sets of parts for the FM-21, in various stages of completion, from simple bare-boards & parts, to completed boards. The FM-21s have been "written-off" as saleable items, and will go at a small fraction of cost. Estimates are that they will cost anywhere from $30 to $60 each (complete), depending upon how many parts are in common with currently used stock (you know, tuned coils, etc. - they NEVER get out of date). The bottom line is this - The rigs won't be sold by him one-ata-time, but if we were willing to make a group purchase, he will fill the orders. If you want to get on 220 (for packet radio, of course), want to get on inexpensively, are willing to complete a partially completed commercial rig, and are willing and able to tune it up, THEN THIS IS FOR YOU. Nothing has been firmed up yet. I would like an indication from all packet radio groups as to how many would wish to purchase rigs. If enough respond, I'll give that info to Ed Clegg, and we can negotiate the price. Please send a list of how many rigs and who they are for, and I'll follow up on this one. I'd be happy to supply more details on this deal, on request. Please DON'T confuse things by contacting Clegg directly - let me handle it as a group purchase.